The dry heat given off by a sauna has various effects on the body, depending on your overall health. According to Harvard Health Publications, a sauna's dry heat, which can reach temperatures of 185 degrees Fahrenheit, causes your skin temperature to soar to about 104 degrees Fahrenheit within a few minutes. Therefore, Harvard Health Publications recommends remaining in a sauna no more than 15 to 20 minutes at a time and drinking plenty of water afterward in order to gain maximum benefits without harming your health. Saunas help improve your skin by opening up your pores and allowing built-up wastes and toxins to flush out as you sweat. Lotions, deodorants, and dead skin cells can clog your pores and lead to acne and painful cysts. The dry heat from a sauna helps your skin avoid infection from these built-up wastes. Also, saunas cleanse your skin by getting rid of the dead skin cells, exposing a fresh new layer of skin that looks and feels younger. 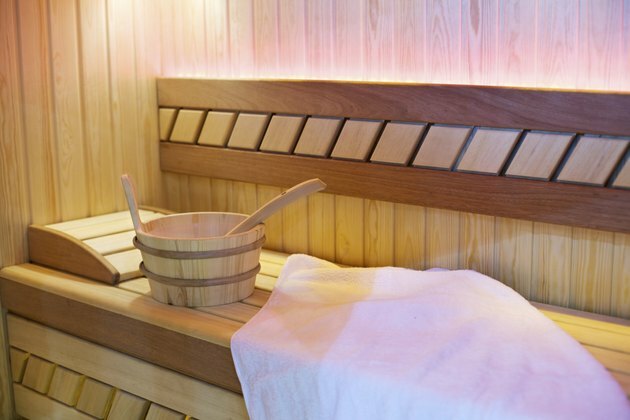 Heat from saunas causes your pulse rate to increase by 30 percent on average. With this increased pulse rate, your heart is capable of doubling the amount of blood pumped each minute. Therefore, there is a boost in oxygen and fluids flowing to the skin cells, resulting in improved circulation and healthier, more refreshed-looking skin. 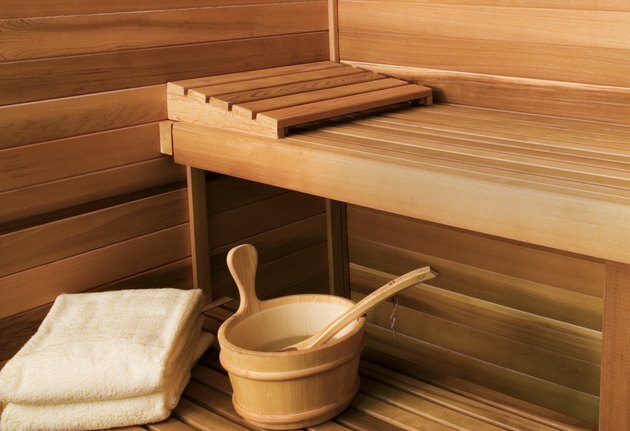 According to Harvard Health Publications, you can lose up to a pint of sweat during a sauna session. The sweat flowing from your body will help wash away toxins in your skin, leaving your skin rejuvenated. Make sure to stay hydrated both before and after spending time in a sauna to maximize this benefit and stay healthy. Sweat also plays a role in regulating your body temperature and may help fight infections. Excessive sweating in a sauna may increase your levels of dermcidin, a protein that fights harmful bacteria. 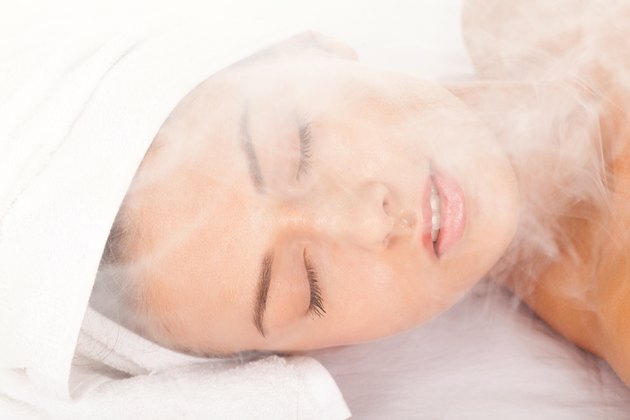 The primary dangers of using a steam or dry sauna is overheating and dehydration. Most people can handle the exposure to high heat. However, children under 12, pregnant women, the elderly and people who are taking heart medications should avoid the sauna treatment. Saunas also should not be used after strenuous exercise. Due to the extreme heat you are at risk for heart failure, if you have an unstable heart condition, the "LA Times" reports. Harvard Health Publications: Sauna Health Benefits : Are saunas healthy or harmful? Pub Med: Effect of regular sauna on epidermal barrier function and stratum corneum water-holding capacity in vivo in humans: a controlled study. The Los Angeles Times: The Sauna: A Good Sweat or a Bad Risk?